Anxiety is a very normal emotion, which gives rise to feelings of nervousness every now and then. An anxiety disorder is a serious medical condition in which people experience a high degree of distress and mental trauma, which causes difficulties in leading a normal life. People suffering from this medical condition experience high levels of anxiety and nervousness almost all the time. Here are the symptoms that indicate you’re suffering from anxiety disorder. Excessive worry – This condition persists if you worry about the day to day activities a bit too much on a regular basis. Stressing too much on very petty things can affect you in an adverse manner. A noticeable sign of excessive worry can be too much fatigue. Sleep problems – Problems falling asleep at the right time and problems in maintaining a sound sleep are two signs that indicate you have an anxiety disorder. Irrational fears – This symptom is not generalized; instead, it is specific and subjective in relation to a particular thing or situation. The fears that are experienced under this category are sudden and unexpected in nature and there is no fixed rationale behind these fears. Muscle tension – Muscle discomfort and pain is one of the leading physiological causes of an anxiety disorder. The pain felt is chronic and pervasive, and is very common among people facing situations of anxiety. If you are exposed to constant periods of anxiety, you will experience fatigue, muscle pains and unwillingness to work. Chronic indigestion – Problems related to the digestive system are also a sign of anxiety disorder. In this case, you may face constant digestive problems accompanied by a common disorder called IBS (Irritable Bowel Syndrome). IBS refers to an anxiety situation in the digestive tract, which is characterized by stomach aches, cramping, bloating, gas, constipation, and/or diarrhoea. 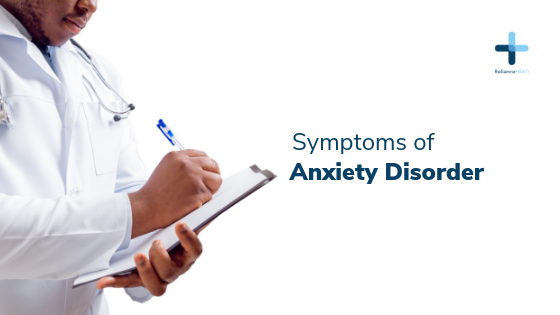 Apart from the above-mentioned symptoms, other symptoms of an anxiety disorder include stage fright, self- consciousness, panic attacks, memory flashbacks, perfectionism, compulsive behaviours, self- doubt, and such others.